There’s a routine at my house in Goa that was very typical of Sunday when I was growing up. I may have written about it quite a few times and I do this only because it has stuck in my head over time and distance. Hear me out again anyway: My father would go to the market in the morning and what felt like hours later, he would come back home on his bike with bags of things at his feet. He would honk for us or my mother to come help him carry everything and the two of them would go on to cleaning fish or chicken or other meat, cooking some of the vegetables and getting food ready for lunch. It seemed like they knew exactly what they were doing. There wasn’t any meal-planning. It was improvised. My mother can confirm or deny this. We were shooed out of the kitchen by my father and over time, I myself learnt only a few of the things they did to cook the meal I miss the most when Sunday comes along. 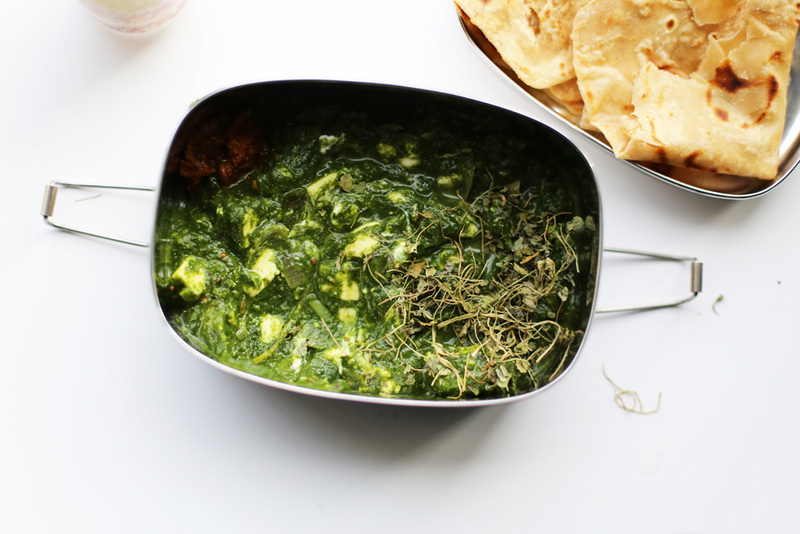 Palak paneer was one of the dishes I have only seen my father make in passing. A lot of the quick food my parents cooked was never taught to us. Them simply letting us cut onions or stir the handi (stainless steel vessel) was our education. All the “encourage your kids at a young age” that’s such a mainstay of modern parenting was the kind of stuff that was put aside for convenience. I wish my dad had the patience to teach us more but that’s the adult me talking. As routines go, it was more important to him and my mother that we had a Sunday lunch on the table that was special. I always looked forward to it and their work was always appreciated. Adult me affirms this. When I make the dishes my parents make, it seems to bring a part of their routine to my life. I have my own shortcuts and of course it won’t ever taste like theirs but when you’re permanently homesick like I am, cooking anything from their kitchen in my own brings me comfort. I can picture the way they run their knives along the onion, my father moving faster and my mother slower but more precise. There won’t ever be a time where I won’t sneak out some paneer when it’s all made and waiting on the stove for when my dad gets back home after cooking (he cannot sit still and I am the same person). It’s hard to be away from home and I feel embarrassed sometimes to describe to people how I’m still not used to things after five years of living in another country. The truth is much more expansive. You don’t just forget things when they influence every choice you will make. Sometimes places don’t let you and neither do the people. But like I said, the truth is endless. 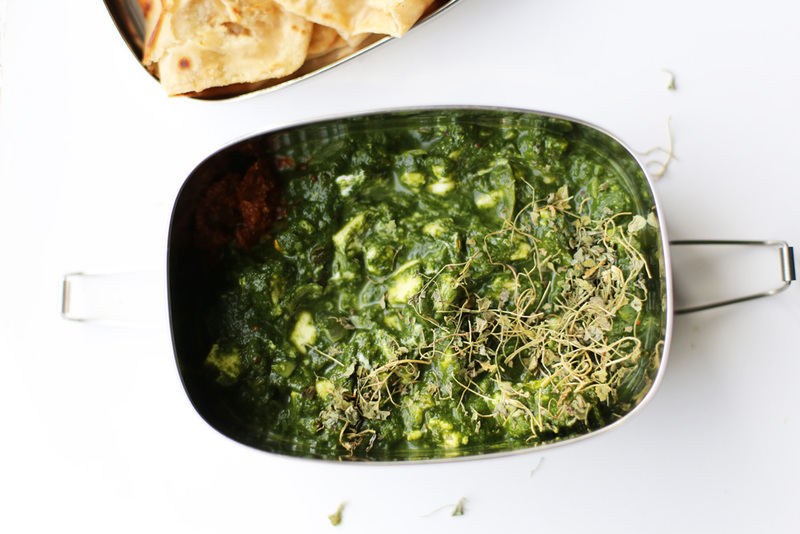 So here’s palak paneer for your Sunday. I won’t be eating this today but as my parents get together as a family in Goa, I will be thinking of them and thinking of that all the wonderful gifts they gave me, cooking for myself when I wake up every morning is really the best one of them all. Place the cheesecloth in a fine mesh strainer over a large bowl and set to the side of the stove. Bring the milk to a rolling boil over medium-high heat, stirring every now and then. As soon as the milk boils with bubbles appearing on the surface, pour in the the vinegar and stir. The milk will split into curds and whey. Keep stirring for about 2 more minutes and then pour the curds into the cheesecloth. Let it drain and cool for about 5 minutes and then tie the cheesecloth tight into a small bundle. Let it continue to drain for an hour or until it forms a solid block that you can easily cut. Cut into 1 inch cubes or cover and refrigerate the paneer block until ready to use. Make an ice bath: Put some ice cubes in a large bowl filled halfway with water and set it by the stove. Blanch the spinach in boiling water until it wilts, about 2-3 minutes. 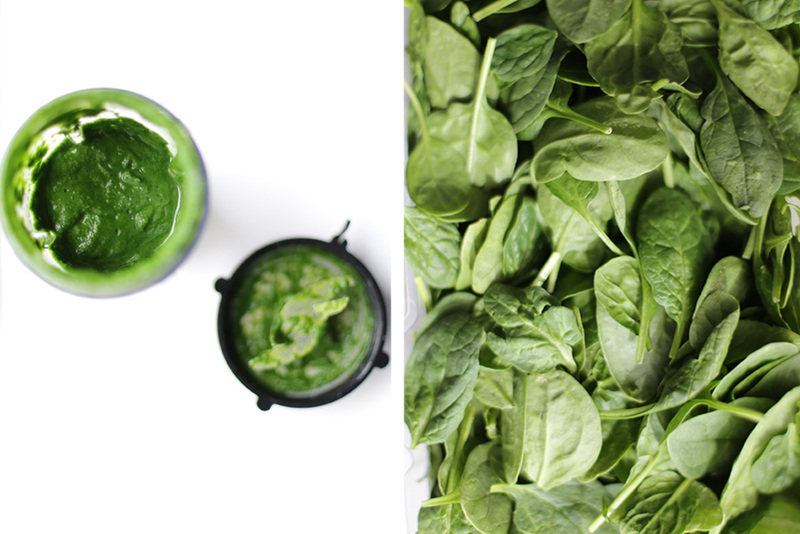 Drain the boiling water, leaving about 1 cup aside and put the spinach into the ice bath to stop it from cooking. This also helps preserve the bright green colour, if you’re into that sort of thing. 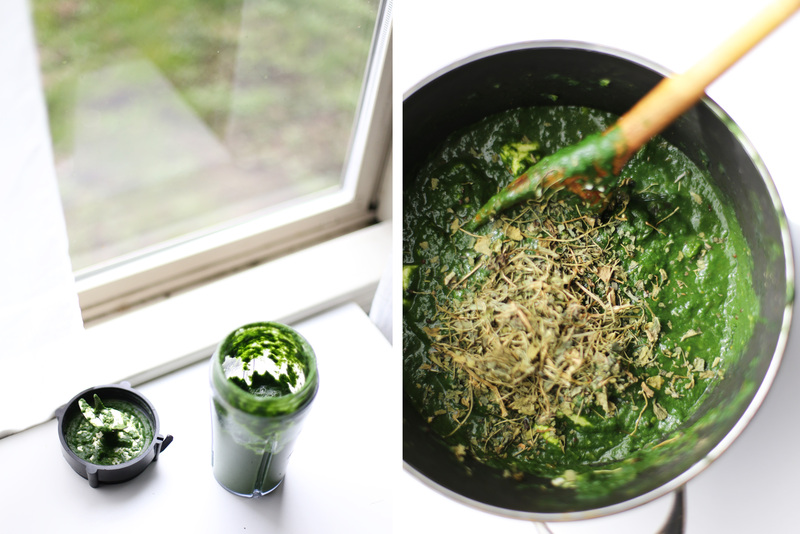 Put the spinach into a high speed blender with about a tablespoon of the cooking water. Blend until it forms a smooth paste. Heat oil in a small saucepan on medium-high heat and add the cumin and mustard seeds to it. Stir until the seeds start to turn fragrant and pop, about 1 minute. Add the onion, garlic and green chillies and turn the heat down to medium. Saute the onions until they brown and soften, about 6 minutes. Stir the turmeric into the onion mixture and then add the pureed spinach to the pot. Add 1/2 cup the blanching water and let the spinach simmer until it thickens, about 5 minutes. 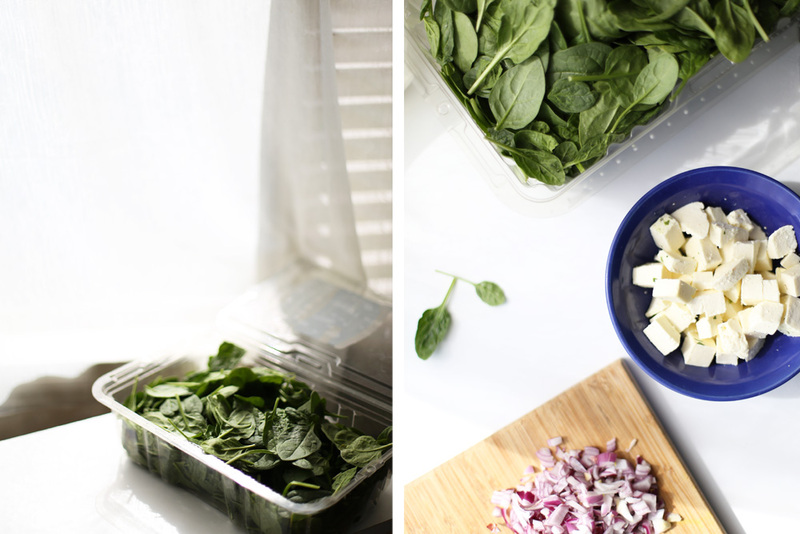 Add more water if the spinach seems to dry out too quickly and then add the paneer (recipe above). Add the garam masala, salt, and let it simmer for a minute more before taking the saucepan off the heat. Stir in the kasuri methi. It’s done! 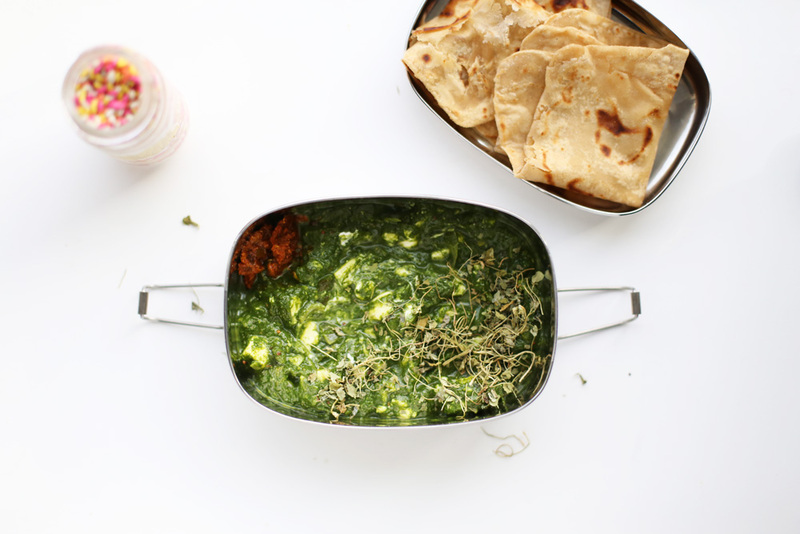 Serve the palak paneer warm with chapatis, pickle and a squeeze of lime juice over the top. Namaste, and happy spring! I’m still hoping you can come and visit us this summer here in Victoria. I know I’m just a random internet acquaintance but I know you’ll love it here and you need a getaway. ☺️ Yummmm, palak paneer!